Tropical Cyclone Nathan made landfall in eastern Queensland, Australia's Cape York Peninsula and was moving west across it when NASA's Aqua satellite passed overhead. The RapidScat instrument revealed that Nathan's strongest winds were south of the center before its landfall. On March 19, from at 1:17 to 2:49 UTC, before landfall, the RapidScat instrument that flies aboard the International Space Station studied Nathan's winds. 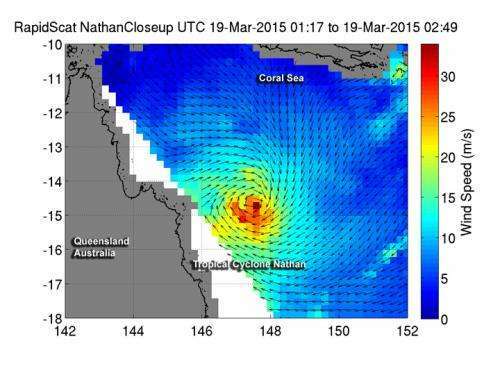 RapidScat data showed the strongest sustained winds reaching over 30 meters per second (108 kph/67 mph) were south of Cyclone Nathan's center. Winds in the other quadrants were not as strong. 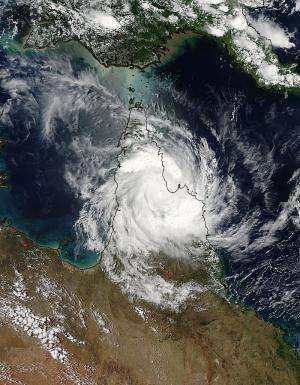 Nathan made landfall on March 19 around 2200 UTC (6 p.m. EDT/March 20 at 4 a.m. local time Queensland) between Cape Flattery and Cape Melville on the Cape York Peninsula in northern Queensland. The MODIS instrument aboard Aqua captured visible data on the storm that was used to create a picture of it at NASA's Goddard Space Flight Center in Greenbelt, Maryland. The image was taken at 4:05 UTC (12:05 a.m. EDT) on March 20 and shows Nathan's clouds cover all of the Cape York Peninsula with the exception of the far northern tip. Bands of thunderstorms spiraled into the center of circulation from the south, where RapidScat had previously seen the storm's strongest winds. An eye was no longer visible as the friction encountered from landfall weakened the storm. The Australian Bureau of Meteorology has issued warnings from Kowanyama to Aurukun, extending inland to Coen. A Tropical Cyclone Watch is in effect from Maningrida to Numbulwar. At 0900 UTC (5 a.m. EDT), Tropical Cyclone Nathan's maximum sustained winds were near 75 knots (86 mph/138.9 kph). It was located near 14.5 south latitude and 143.2 east longitude, about 208 nautical miles (293.4 miles/385.2 km) northwest of Cairns, Australia. At that time, Nathan was moving to the west at 9 knots (10.2 mph/16.6 kph). At 1200 UTC (8 a.m. EDT/10 p.m. local time Queensland), the Australian Bureau of Meteorology (ABM) noted that Nathan's maximum sustained winds were near 46.6 mph/ 75 kph. It had moved to 14.4 degrees south and 142.2 degrees east, about 75 miles/120 km west-southwest of Coen and 81 miles/130 kilometers north northeast of Kowanyama. Nathan was moving to the west at 9.7 knots (11.1 mph/18 kph). The ABM expects Tropical Cyclone Nathan to emerge into the Gulf of Carpentaria early on Saturday morning (local time) and continue moving west while intensifying. For updated forecasts, watches and warnings, visit ABM's website: http://www.bom.gov.au/cyclone. The Joint Typhoon Warning Center (JTWC) expects the storm to regenerate in the Gulf of Carpentaria, reaching up to 80 knots before making a second landfall late on March 21 (UTC) on the Gove Peninsula on the western side of the gulf. Nathan is then expected to pass along the coast of the Top End.